There are certain things one has to know when choosing where to go at Porto during the night. First of all, Porto’s nightlife it’s not all about downtown. There’s what we call the uptown part of the city. Second, but not less important, if Porto has a strong connection to cultural and international artistic movements some of these credits belong to Maus Hábitos (Bad Habits). And I’m not talking about being up to date in underground artistic expressions. Maus Hábitos has been, for a long time, the home of transgressive cultural interventions with strong connections to what’s happening in Rotterdam, Hannover, and Barcelona. It’s a melting pot of cultural activities breaking new grounds with incendiary defiance. There are always interesting exhibitions at Maus Hábitos. This is only one of Maus Hábitos’ faces. 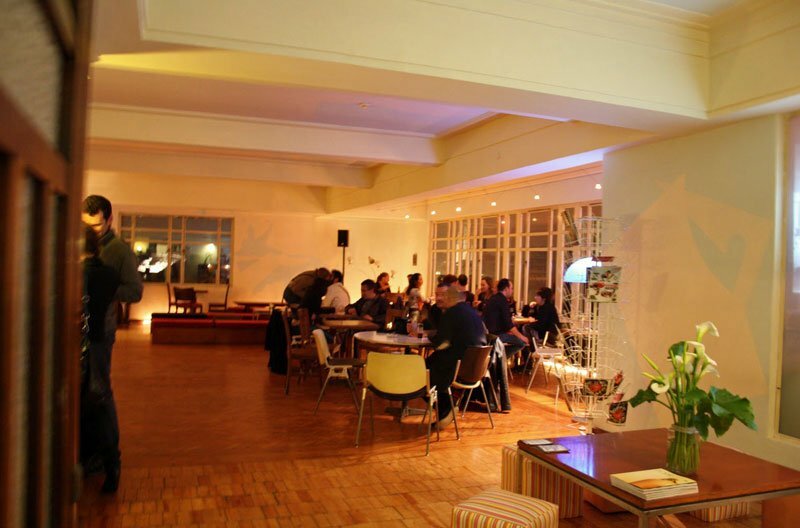 It’s a place of unconformity, equipped with an unconventional art gallery, a lounge bar, a lovely interior yard and terrace, a concert hall and much more, where regular costumers and artists passing by, get along. Being located on the forth flour, you can take the elevator or the stairs and it’s mystic starts there. Going up to a higher level of entertainment. During the weekend it’s not unusual to watch a concert or a show of any kind or to take part in some crazy dancehall. The lindy hop nights are positively exhausting. During week days the entrance is free of charge, and in case there’s some show going on, if it isn’t on the lounge bar one only has to pay to enter the show. Usually on weekends the entrance is paid. The open sky terrace of Maus Hábitos. Maus Hábitos‘ location puts it right in front of Passos Manuel, another great club directed to fine and deviant arts. On the same street, further down, there’s Pitch Club, which brings the best electronic music to the city. These three places joined efforts to create a periodical special night event at Porto, called “Alta Baixa”, something like “uptown dowtown” (in Portuguese) where, with a single pass of 5 Euros, one can jump around between them all night long watching memorable music shows.